Congressional voting records. Appropriation amounts. More acronyms than you can shake a scuffle hoe at. Starting to feel overwhelmed already by the massive amount of data surrounding the Farm Bill? Sometimes when we’re feeling swamped, we turn to FarmBillPrimer.org, a great resource for data, maps, and analysis. 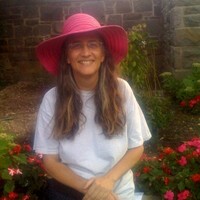 This week we scored an interview with Marjorie Roswell, the creator of FarmBillPrimer.org. Enjoy! NYFC: Your site contains a wealth of data about the Farm Bill digested into easy-to-read maps and graphics. I find myself often checking in when I need to know who in Congress sits on which ag committee. 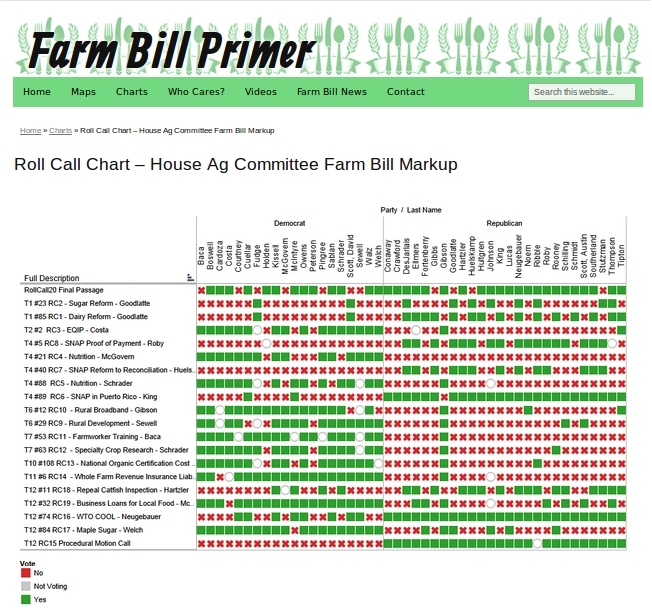 And your charts – from keeping track of pro-farmer bills and who support them to following where federal money flows – are an amazing resource to pore over! But first, who exactly is FarmBillPrimer.org, and what inspired you to create this resource? MR: I created FarmBillPrimer.org in 2006, after one of the advocacy groups sent out an alphabet soup table. EQIP, CRP, WHIP. (WHIP?! CRP?!) I knew it mattered, and I knew I didn’t have a clue what it all meant. So I wrote to the Comfood listserve, and one kind soul, Hank Herrera, responded, helping me to sort out all the acronyms, and categorize them. I had a picture in my head of how to visualize the alphabet soup spreadsheet so that more people could understand it… I talked to soooo many groups about my idea. Thankfully after a few years of sharing the idea, the Hopkins Center for Livable Future (CLF) took it on, working with USDA to create the underlying dataset. Lo and Behold, Daniel Bowman Simon showed up at the Hackathon with the exact same idea. We had both independently gotten started! We had even downloaded the same Census map, and begun to work with it in a GIS program. So, a collaboration was born! Daniel was a great inspiration. Several members of the food system community have also helped out along the way. Rebekah Wilce, and Jill Richardson, especially helped move various visualizations forward. NYFC: We are starting to enter the “mark up” phase of the new farm bill, where the Congressional Ag committees write a draft of the Farm Bill. What is the best way to keep up-to-date on how the mark-up process is going? MR: I’ll be sharing content with the National Sustainable Agriculture Coalition. So look at either sustainableagriculture.net , or FarmBillPrimer.org. They’ll be tweeting, I’ll be tweeting. You can check out last year’s amendment chart and amendment list to get a sense of what markup amendments looked like last Fall (before Congress completely shut down the process, until now). You can even click on “roll call” to see (wherever there was an actual roll call vote) to see who voted how. NYFC: Great! And of course the Young Farmers Coalition will be sharing information by our blog and social media as well. Next – what would you say are the most useful resources you have for someone who is still trying to wrap their head around how the Farm Bill works? MR: I’m still trying to wrap my head around how the Farm Bill works, too! I would say it’s challenging. But worthwhile. Sometimes, if I’m on a laptop, I just rotate the laptop to be able to read the categories. 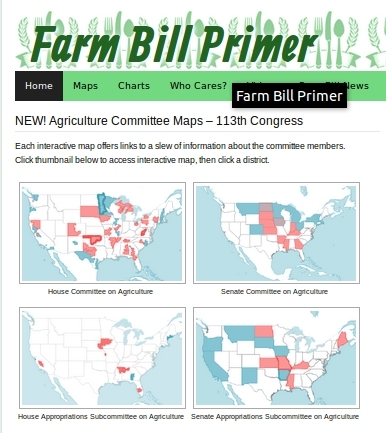 Also, of course, look at the committee maps on FarmBillPrimer.org, and see if you, or anyone you know, is served by an Ag Committee member. The MOST useful resources will be the staff of your congress members. Meet with them. Talk to them. Share what you know, and ask what they know. And share your priorities with them. NYFC: As a farmer with a Congressman on the Ag Committee (Rep. Chris Gibson), I love being able to look up his voting record on farm program spending. Is this section going to be continued in the future? MR: I’m doing this work as a volunteer, but I’m very committed to it. I cleared the week from taking on client work so that I could track the markup next week. Most of the amendments will be voice votes, where it’s almost impossible to suss out who voted which way. But wherever there is a roll-call vote, I’ll link to it. NYFC: As you’ve pulled together this wealth of information, what does it tell you about the prospects for the upcoming Farm Bill and how things will change for beginning farmers? MR: The most essential thing is that beginning farmers get involved. I think (I’m pretty sure) that the prospects for beginning farmers are very, very challenging. I think we all have a tendency to think that “they” (some undefined “they”) will be working on the issues on our behalf, but it’s really a very small community. It’s us. NYFC: You’re absolutely right! Thank you so much for talking with us, and we’re excited for a hell of a fight this summer! 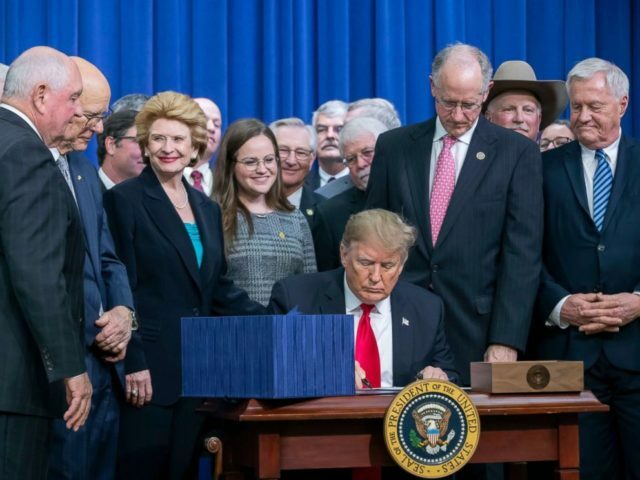 « previous article: Farm Bill News – Mark-Up Starts Next Week!